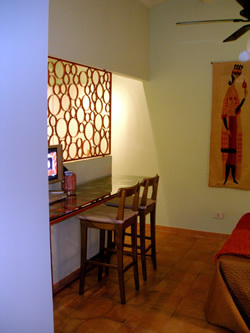 The studio apartment is behind the Colosseum in the antique neighborhood of Celio. 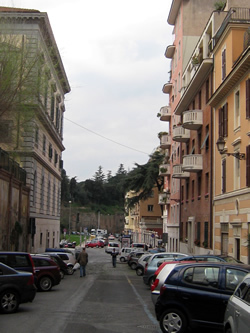 It is nestled between San Giovanni, San Clemente, the park of Villa Celimontana and the Colosseum. Located on Via Annia only a five minute walk to the Roman Forum, the Domus Aurea, the Palatino Hill and a 15 minute walk to Piazza Venezia, the Trevi Fountain and the Spanish Steps. Similarly, the metro and bus stops are only 5 minutes away to take you anywhere in Rome. 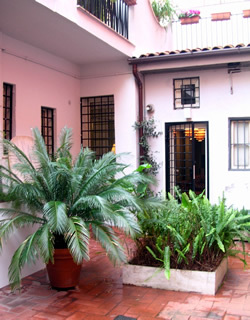 This charminig newly renovated and decorated studio apartment is set on the ground floor courtyard of a 1924 building. The courtyard is lush with plants. 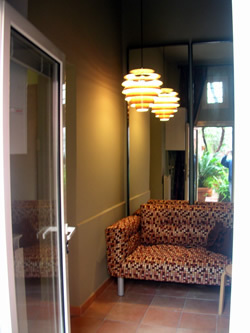 The entry serves as a sitting as well as sleeping area with a convertable single sofa bed. 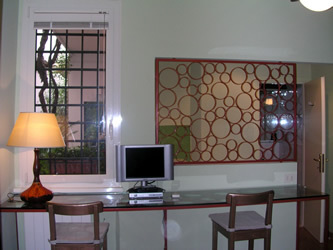 The main room has a custom made qween size bed, armoire and dining / breakfast bar. 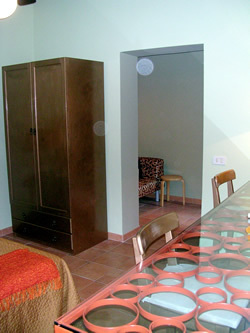 Off of the main room is the kitchen and bathroom with shower. 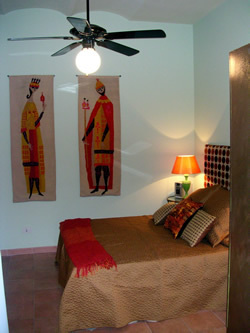 The studio apartment sleeps up to three people. Around the corner from the apartment are several restaurants, coffee bars, English pubs,wine bars, a daily fresh fruit and vegetable market in the morning, two large and two small grocery stores, farmacy and a popular Gay bar across from the Colosseum. Late check-in fees apply. See terms and conditions. Client may request information regarding price and availability by sending an inquiry by clicking on “Check Availability.” An inquiry form will appear. Price depends on longevity of stay. Additional fee of €20.00 for late check in after 7:30 pm and €40.00 additional fee for late check-in after 10:00 pm and holidays. 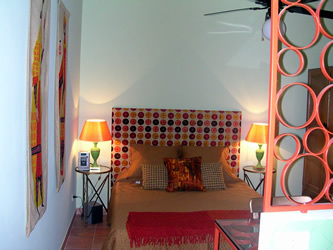 For longer stays of two weeks, electricity and gas ustilities will be additionally charged. A 30% deposit required for reservations. Balance of rental fee and a 50% security deposit due upon check in. The security deposit to be paid in cash and refunded at the end of the stay. Form of payment may be made in cash, wire transfer to a US or European bank account and Paypal. 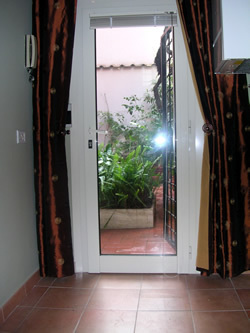 Once availability of the studio is confirmed a contract listing complete terms and conditions will be provided. Please feel free to inquire.